According to the book cover of Spitting Image, Mattias' debut is being marketed as "a novel of mystery and misadventure." The entire concept of the series reminds me much of the Stephanie Plum series by Janet Evanovich. Simone and Kevin experience a litany of kooky and crazy mishaps on their journey to solving the mystery, and on finding out why Curtis is so strange and secretive. Simone lacks common sense, and isn't very intelligent. Her character's idiocy just isn't charming enough to win over readers (or at least me, anyway), and will most likely cause readers to repeatedly groan in frustration. Additionally, the humor in Spitting Image falls flat, and the plot too over-the-top even to be regarded as cute, random, or silly. The beginning of Spitting Image gives the impression that Simone's skills in the art restoration profession will guide her through solving the mystery, but art restoration is not mentioned again in this novel until the very end. Perhaps if this novel had revisited Simone's "theme" throughout the story (like coffee for Clare Cosi in Cleo Coyle's coffeehouse mysteries, or bounty hunter-related tasks for Stephanie Plum), it would have been more interesting, but the book is all over the place, and too unbelievable. 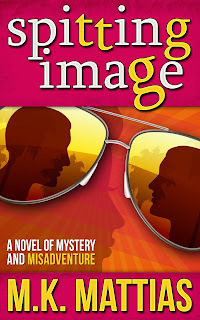 Although there are many unbelievable, quirky, and random scenes in all types of mystery novels, especially the cozy mystery genre in particular, the quirks in Spitting Image are just not as witty. Although I may not have enjoyed my time with Spitting Image, I stuck with it because it's fast-paced and short, and I was really hoping it would redeem itself toward the end. However, even seasoned readers will have no problems predicting this book's denouement. If you enjoy humorous and comedic mystery novels, try the Stephanie Plum series by Janet Evanovich and the Agatha Raisin series by M.C. Beaton. What are your favorite mystery novels? Did you read Spitting Image, and if so, what did you think? Share your comments with us below!